We are the Shanty Sisters! We are two sisters that wear many hats! Whitney is a stay-at-home mother with 5 kids, and Ashley is a stay-at-home mother of 3. We started blogging when we both moved into new homes, and were challenged to decorate more space on a budget. 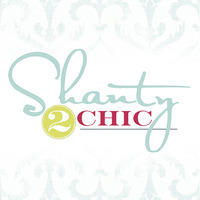 We love scouring high and low for shanty items and transforming them into something chic, which led us to our blog Shanty2Chic! We will take you along on our journey as we learn to transform our homes on a budget, and prove to ourselves that we don’t need to wait on our husbands to do the big jobs! We hope to inspire you to grab a paint bucket, pick up that scary tool, and get to work! How tall are your cielings? You don't list the size of mirrors need. Can you also tell me how heavy this is once completed could you hang it on a wall? Love it and want to build one myself. I think I'm going to build this project as soon I replace all my tools that were stolen. I have a new 12x16 building to turn into my hobby shop. I already have a Ryobi table saw. They couldn't load it I guess. The Wall Organizer is awesome! I love this wall organizer. I ended up making one for my mother, sister, and myself. I have a couple of friends that now want one. Where did you get your baskets and hooks from? On the PDF, on step 8 you are going to show us how to use 1x8 boards on the next page. There is no next page. @JulMuffley65 We are looking into this for you! I love this!I wish you would have posted it last week. I tried to make one and after 4 tries, mine isn’t nearly this cute 😊. Great build! The door-fronts are beautiful! Is there a certain kreg jig that I should buy? How do you download plans? Click on the blue hyperlink that says "View Project PDF." Do you provide a cut list by chance? Click on "View Project PDF" above. It has the plans and cut list. Can never be too organized! Great build. Is there a cut list? Hi @samartinez27, click the blue link that says "view project pdf" and page 2 shows cut sizes. Wish I had one of these for my granddaughter! Awesome build, time to get the sleeves rolled up and get to work. Thank you for the plans. I adore this project and this color blue! Love Love Love! Great job again ladies :-). Is there a reason why you attached the shelve pieces with screws from the outside versus the inside? If you screwed the screws on the inside you would not have left screw holes on the outside of the shelf and have to patch them prior to painting. GREAT IDEA Iwould have liked to come up with this project, but at least you made the plans available. I'm Disabled and of course it will take me forever to complete this project but I will be Taking the Challenge on plus I guess it will keep me busy. My weekend project. I was just sscratching my head about the lack of space to store my mothers day gifts. This is perfect. The hinges are missing from the material list. #14 X ¾” SELF DRILLING HEX HEAD SCREWS - these aren't used anywhere in the plans. Just cleaning out in-laws house, getting ready to move in and have 5 + pickup loads of wood to use for this. I love how yours turned out. I am so grateful that you share all your tutorials. This is absolutely beautiful, I have been building up my shop so hope to try this soon, If not this Christmas maybe by next year. Love it. Love these! Guess they can go on my to do list. Love the island! I downloaded the plans for it - thanks so much. I've been looking for the link to win the compound saw. I'd love to win it, but not sure what to do to get on the list. Awesome video ladies, thanks for creating and sharing it with us. I've had tiles in my basement for just shy of 6 years that I need to put in my kitchen. They are the 1x1 tiles in a 12 x 12 square on the mesh. Can I use the same process as this, or will I need to mix up the bottom adhesive because of all the little tiles in each mesh square? Thanks bunches!! It looks amazing!! I can't wait to move into a new home so I can try this out!! Years ago I traveled for work. At each place I bought a mug. I've never had a good way to display them until now. Thank you so much. This is a great project. No longer having to reach to the back of a cupboard to get a coffee mug out in the morning; one can enjoy their coffee every day! I've been looking for hooks like that to do a similar project...where did you find them? I cannot print the steps to follow this project. WHY?? How do I get the project plans? Click "project steps". There is no downloadable pdf for this one.